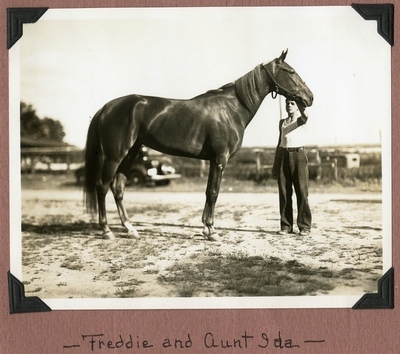 Sepia tone photo of young Freddie Bradbury holding Aunt Ida near the sheds at Union Park Trotting Association on Friday, August 2, 1935. Aunt Ida was owned by Newbrook Stable. Freddie Bradbury would go on to become a driver.